…he may have been detained by the local sweet shop, who appear to have chained him to a telephone pole. Next → Next post: Which way? My, he’ll make a mighty decent rabbit pie! Someone’s seen Donnie Darko to many times. 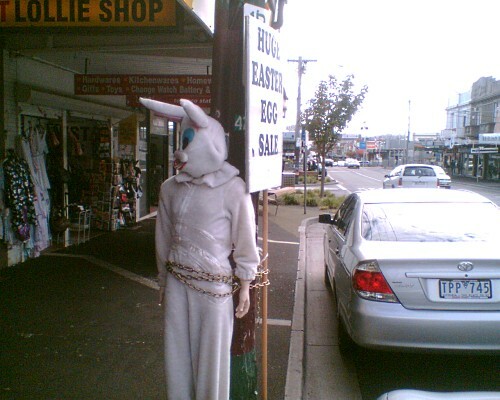 I saw this bunny on the weekend and it looks extra creepy in real life! Although the chains were gone, just lots of packin tape.